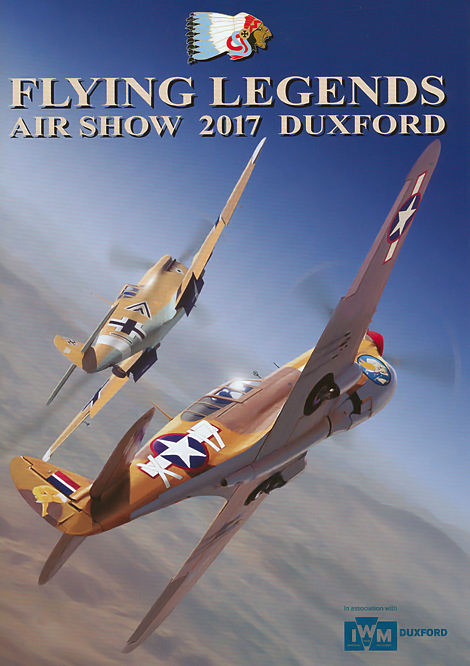 Every year during the summer, the Duxford Airfield takes dives into the past, to present the famous Flying Legends, which has earned a reputation in the world of aviation enthusiasts. This major event in the world of warbirds is organized jointly by the "Fighter Collection" and the "Imperial War Museum". As every year, the air show was of great quality thanks to the organizers who have really figured out the concept well, thanks to all the technical personnel, and other personnel and people who know exactly what to do to achieve such beautiful results, and thanks to the pilots who perfectly master these historical jewels. But the show is not limited to presentations in flight, the show is also present on the ground with, amongst others, dozens of people in vintage dress-up, creating the complete atmosphere of the era, much to the delight of photographers and other visitors. It was very possible that one could cross the historical comic duo, Laurel & Hardy, to photograph the warbirds with pilots and mechanics, as real as back in the day, or even to relive the musical atmosphere of the 40's. 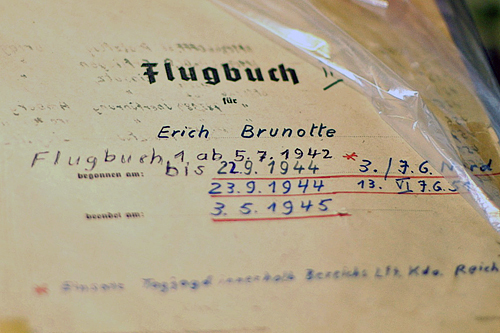 This edition was also the occasion thanks to the IWM's media service to meet 94-year-old German Feldwebel Erich Brunotte, who is still passionate about the world of aviation. As for the airshow, it was a festival of Spitfires, Hurricanes, B-17, DC-3 and many others. But the guest star of this edition was the "Mustang" from North American, two samples of which came all the way from the United States. It is therefore necessary to emphasize the presence of the P-51D "Frenesi" which unfortunately was unable to soar the skies on Saturday due to a technical issue. One of the highlights of the show was the presentation of the "Horsemen" team on P-51D Mustang which made a fantastic presentation of precision flying, in close formation. Thumb up for Dan Friedkin, Steve Hinton and Ed Shipley. The second Mustang from the States was the magnificent P-51B "Berlin Express". This superb machine actually flew from the country of Uncle Sam to Duxford. Simply fantastic, don't you think? On Saturday, after the Spitfire ballet that opened the show, it was the turn of the famous "Berlin Express" which started its demonstration by gaining altitude. Once the clearance for the show was granted, the latter dove down to gain speed, and offer photographers a superb pass "on the English way" as we say in the scene. After this, the aircraft recovered some altitude, initiated a circuit and lowered its landing gear, much to the astonishment of the spectators, a technical problem seemed very likely. Looking at the photos (thank you digital pictures) we noticed that in a fraction of a second the canopy of the Mustang had splintered during the acceleration. The shards of the canopy damaged the vertical fin, and one of the horizontal stabilizer, "Berlin Express" could not take part in the show on Sunday anymore. Luckily, more fear than hurt for the pilot, who certainly had a serious scare during the incident. But as we say, the show must go on and one of the second highlights of this weekend was the simultaneous presentation of five Hawker Hurricanes. It was simply fantastic to see so many of these impressive World War II fighter together, especially when we know that there are only eleven machines currently flying, but the Hurricane is becoming a must, and others are in the restoration phase. Let us not forget that during the Battle of Britain, it was the Hurricane who shot down the largest number of enemy planes. In short, the Flying Legends offered a non-stop show throughout the afternoon and as it should, the finale was the famous "Balbo", where most planes are back into the air for some formation passes. This remains a grandiose moment, which enables us to imagine what great formations of planes left England to go to battle on the occupied continent. Unfortunately, the Sunday "Balbo", which ended the two days of air show was stained by another incident. Indeed, at the time of the final break, the TF-51D Mustang "Miss Velma" suffered engine problems, and asked for an emergency landing. The plane overflew the terrain in the opposite direction, made a rather sharp turn left, and lined up for the final. But in the end the pilot saw that he probably would not be able to reach the runway safely, and just before the threshold of the runway, you have the M11 motorway, so the pilot preferred to turn to the right to finish his flight in a field. He also had the reflex to bring in the landing gear, which allowed a belly landing in a wheat field, which limited the damage and allowed the pilot to escape unharmed. It is also by situations like this, that one can emphasize the great mastery of all these pilots of warbirds that we mention a little earlier in this article. But let's not forget that the "Flying Legends" is first and foremost a festival of historical aviation and that once again, the 2017 edition was a good vintage. So don't hesitate to take the road to Duxford and go see one of the three annual airshows, the trip is well worth it, and the British welcome is, for me, always most warm and passionate. With these few lines, SBAP would like to thank once again the media team of the Imperial War Museum, and Mrs Esther Blaine in particular, for the warm welcome, all facilities and opportunities offered during our visit. Erich Brunotte was born on June 2nd, 1923. From his early teenage years he turned to the aviation world and passed his A, B and C glider licenses between 1940 and 1941. On June 3rd, 1941, he entered the Luftwaffe to be trained as a fighter pilot. Between October 20th, 1941 and March 31st, 1942, Erich Brunotte was drafted into the reserve. On July 4th, 1942 he joined the 5./A.Flg in Oschatz. Between July 1942 and April 1943, he was assigned I./K.G. 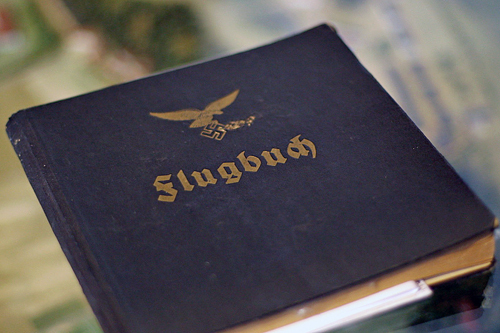 172 Stabsstaffel in Stalingrad. During this period, he would receive various assignments on the eastern front, including the 1./Gruppe Nauhaufklarungs Geschwader 102. In August 1944 he was admitted to the Staffel 13 of the IIV./Jagdgeswader 51 "Molders" which Remains his pride still today, and returned to Germany afterwards. 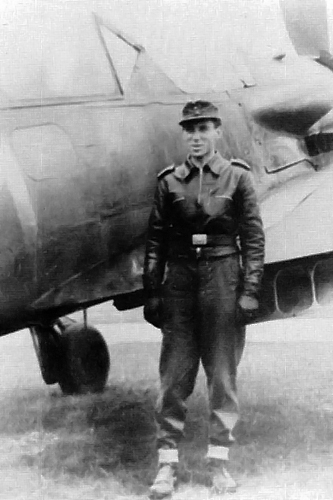 Credited to 33 victories, Erich Brunotte flew his last combat mission on May 3rd, 1945 from Flensburg in northern Germany aboard the Focke Wulf 190 D9 "Weibe 11". His career with the Luftwaffe allowed him to fly on many aircraft such as the Bücker 131 "Jungmann", 133 "Jungmeister" and 181 "Bestman", Klem Kl35, Arado Ar 96, Focke Wulf Fw 56 "Stosser" And 58 "Weihe", Fieseler Fi 156 "Storch" Messerschmitt Bf 108 "Taifun". Of course, he flew on Messerschmitt Bf 109 type E, T, F, G and K as well as the Focke Wulf Fw 190 type A6, A8, A9 and D9. His career as a fighter pilot ended, of course, with the end of the Second World War. At 94 years old, always young-minded, Erich Brunotte, the enemy of yesterday, has become a friend of today. Proof is the warm handshake between Erich Brunotte and John Romain pictured for posterity. North American P-51B-1 "Berlin Express"
North American P-51D (F-6K) "Frenesi"
North American P-51D-20 "Miss Helen"
Boeing B-17G Flying Fortress "Sally B"
P-51B Mustang "Berlin Express" (N-515ZB) departed his Texas base on June 28th and arrived at Duxford Airfield on July 4th. Heritage Flight Alumni Lee Lauderback was the pilot of this amazinbg flight and was following the same route as part of the military troop buildup in the UK during WW II. The called 5,470-mile journey began on June 28th in Texas. 'Berlin Express' is an iconic war plane and a symbol of the US aviation history said Dan Friedkin, chairman and CEO of The Friedkin Group, Horsemen Flight Team member and founder of the Air Force Heritage Flight Foundation. 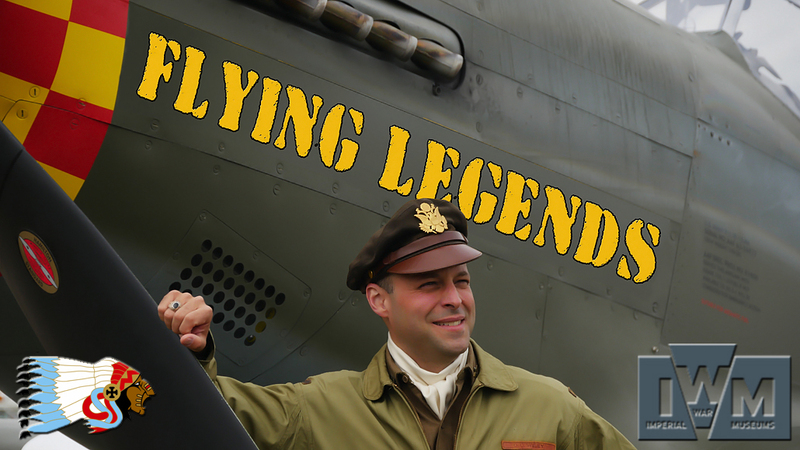 "It's an honor to pilot this aircraft in the Flying Legends Airshow as we pay homage to the brave men and women who have flown in the U.S. Air Force". The route followed by Lauderback and "Berlin Express" departed the Texas base to Paducah (Kentucky), Dunkirk (New York), Bangor (Maine), Goose Bay (Canada), Narsarsuaq (Greenland), Keflavik (Iceland) and Wick (Scotland) before landing at Duxford Airfield. The restored "Berlin Express" is based around the remains of the P-51B 43-24837. This Mustang flew with the 9th Air Force's 363rd Fighter Group out of RAF Staplehurst in Kent, England. It crashed in Beckley on June 10th, 1944 after the pilot was forced to bail out during a training exercise. Sporting a "Malcolm Hood" canopy and wearing the markings for "Berlin Express," it is dressed exactly like the 357th Fighter Group Mustang which Overstreet famously flew under the Eiffel Tower in 1944. William Bruce "Bill" Overstreet Jr. was born on April 10th, 1921 and was an American fighter pilot and a veteran of the 357th Fighter Group, 363rd Fighter Squadron of the United States Army Air Forces during World War II. He is best known for his solo pursuit of a German Messerschmitt Bf 109G underneath the arches of the Eiffel Tower in 1944. 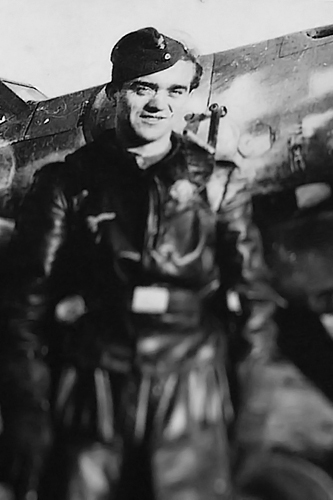 Overstreet had followed a Bf109 from the enemy fighter sortie on the US bomber group he was escorting. After most of the German fighters had broken off the attack, Overstreet and the German had begun a running dogfight, but as they neared Paris, the Messerschmitt now had Overstreet and his Mustang on his tail. The Bf109 pilot flew over Paris hoping that the heavy German triple A batteries surrounding the city would solve his problem and eliminate Overstreet and his "Berlin Express". Overstreet managed to get some hits in at about 1500 feet. The German's engine was hit and damaged, but Overstreet stayed on his tail braving the intense enemy ground fire. The German pilot's desperation undoubtedly growing, he aimed his plane at the Eiffel Tower and in a surprising maneuver, flew beneath it. Undeterred, Overstreet followed right behind him, scoring several more hits in the process. The German plane crashed and Overstreet escaped the heavy flak around Paris by flying low and full throttle down the Seine until he had cleared the heavily defended city's anti-aircraft batteries. This amazing scene of Overstreet chasing and downing the enemy plane gave immense inspiration to the French citizens and the Resistance. He was awarded the France's highest military award, "Ordre national de la Légion d'honneur" by the French Ambassador to the United States Pierre Vimont at a ceremony held at the National D-Day Memorial in Bedford, Virginia.on June 6th, 2009. William Bruce "Bill" Overstreet Jr. passed away on December 29th, 2013, he was 92 years old. Technically, the restored "Frenesi" was an F-6K and was sold surplus immediately following WWII, registered as NX66111, the aircraft was entered into the 1946 Cleveland Air Races as racer No.80 "Full House", but its engine failed and the flight ended I a crash landing. The aircraft was sold to Jack Hardwick in the early 1950?s and rebuilt, with a jump seat and rudimentary dual controls installed in the back of the cockpit, and was sold onto the Dominican Air Force in 1954, becoming FAD 1900. The aircraft served with the Dominican AF until it was sold and imported back into the US in 1984. The aircraft flew again on the US register as N21023 by 1990, and was sold to Jim Beasley Sr. and later owned/operated by Jim Beasley Jr. During this time the aircraft was painted as "Frenesi", the personal mount of WWII 357th Fighter Group ace Gen. Tommy Hayes (the name inspired from a 1940 Artie Shaw tune). A complete rebuild of the airframe began. By 2009, the project was sold to Dan Friedkin, now registered as N357FG, and the restoration was continued at Midwest Aero Restorations, known for their award-winning authentic Mustang rebuilds. The aircraft has now emerged in early 2017, resplendent and flying again in the markings of "Frenesi". P-51D-5-NA #44-13318 "Frenesi" was flown by Lt. Col. Thomas L. Hayes, Jr. Hayes got his pilot's wings in February 1941 and flew P-40s with the 17th Pursuit Squadron. He was shot down and wounded in February 1942. After recovering from his wounds, he was assigned to the 35th Fighter Group, flying P-39s and P-40s. While in this unit, he was credited with two Japanese aircraft destroyed on the ground. He later joined the 357th Fighter Group and took command of the 364th Fighter Squadron in May 1943. He was also appointed Deputy Commander of the 357th Fighter Group in March 1944. By the time he returned to the US in August 1944, he was credited with 8.5 aerial victories and 2 ground victories.